Sage Marshall’s Dad grew up in an Algonquin community in Quebec and her Mom in a Mi’kmaq community in Cape Breton, NS. 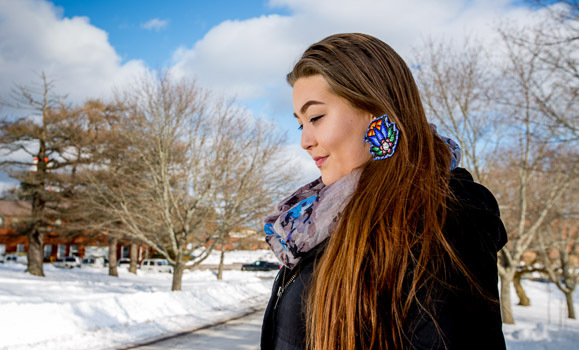 All of her life, Sage Marshall has felt a strong connection to her Aboriginal heritage, traditions and her community so when she enrolled in a post-secondary program after high school in the bustling city of Ottawa, she felt lost, alone and missed her family and community. When Sage discovered the Aboriginal Health Sciences Success (AHSS) program at Dalhousie’s Faculty of Agriculture in Truro, NS, she began to feel optimistic that this could be the right fit. She had heard about the program from a friend and liked that it was designed for people with a similar background and that it had a strong support system in place. Now enrolled in the two-year program that helps students with the transition from high school to university, Sage is re-energized by the opportunities in front of her and the range of subjects she’s learning. “In the first year you get such a mix of different courses. It really helps you figure out what you might want to do for your career,” she explains. In the first year, students are enrolled in three of Dalhousie’s credit courses and two university prep courses. In the second year, students complete credit courses in the fall and winter terms, which prepare them to continue on to full-time studies in the health professions, health sciences, science or agriculture. The coordinator of the AHSS program, Art Stevens, works with students like Sage to make sure their transition to Dal’s Truro campus is smooth and that they feel supported throughout their time here. Sage credits her success to people like Art who are also from Aboriginal communities and who give her the kind of educational and emotional support she needs to excel in her courses. Sage also credits her academic success to her professors who know her by name and who are willing to give her one-on-one attention. Sage hopes to become a teacher, too and educate young people about Aboriginal history and its profound impact on our nation’s history. Before she becomes a teacher in the classroom, Sage recognizes, as the oldest sibling in her family, that teaching starts at home.